Hoya R72 Infra-red filter review. If you're interested in Infra-red photography, you might try one of these Hoya R72 filters out. There are a whole bunch of IR filters out there to choose from, but the Hoya R72 IR filter is redily available, and great for general use. Although they're somewhat expensive depending on the size, it'll be cheaper than converting your digital camera to shoot IR, which requires removing the IR filter that's in front of the sensor. Unfortunately, after you do that you can't shoot regular color pictures unless you replace it. This review is about the simple use of a Hoya R72 filter as installed on a modern digital camera. If you want to learn more about IR photography in general, Google it and pick out one or more of the millions of web pages dedicated to this. You can also learn how to use an IR filter to see through women's clothing, like the feature Sony had on their nightshot camcorders a few years back, see a variation of this trick here. It's possible to hand hold the camera and get some IR images; you'll need to use a really high ISO, and guess at the composition as you won't be able to see it with the filter on. I included a hand-held sample shot in the review. Green trees and plants reflect a lot of IR so they look white in the image. Blue skies have little or no IR, so no light is reflected back, and that makes the sky look dark, like you took the picture at night! If you're the type that likes to look at sharp images blown way up on the computer screen, the IR filter is not for you. Since only part of the color pixels are being used as an end result, due to the filter, the image appears a little soft. However, since you'll typically need a long exposure, you'll have issues with leaves, branches, and anything else that would move during several seconds of exposure time. IR photography is all about creating a "feeling" or "mood" from the scene, and the intended results from it are somewhat similar to the weird Cokin filters you could buy back in the 80s-90s that made pictures look dreamy. The images in the review are very boring, but are adequate for showing what the filter does. My creativity level seem a little flat this week. You can create a fake IR image by changing the saturation, brightness and hue of the colors, (in the case of foliage), mostly by manipulating the green channel; and by that I mean change the green colors to a yellow in the hue mode, and brighten the yellow in brightness or luminosity mode. Photo Imaging software like Lightroom, Photoshop, ACDsee pro 3 and others offer this type of "mixing" or color channel manipulation. You can get crazy and do some other trick procedures to make it look more real if you have nothing but time on your hands. You can't really get the same "feel" of IR in software, so if you want the genuine IR look you'll have to get a filter, or have your camera converted. New recommended accessories page, and lens review page changes. I posted a second recommended product page, this time for accessories, like filters, flashes and other handy items, both pages are listed on the nav bar and right column on the homepage. I also added a few new items to the recommended cameras and lenses page, like the Vivitar 7mm fisheye, which I bought, and the Tamron 70-200mm F/2.8, which is a great buy for people interested in optical quality only. Most items on the recommended pages I own, and use on a regular basis. I'm pretty "thrifty" myself, so the items also offer a good value in addition to being a genuinely useful product. I'm going to add another page in the near future, which will highlight my favorite interior/real estate photography related equipment, somewhat like this page, but with only the items listed. The lens reviews page has been updated using three columns instead of two. The NEX lenses are listed separately at the bottom left, and all the after-market lenses like Tamron and Sigma are on the top right. Additionally, the lens comparisons and related articles are now listed in the lens articles and comparisons page. Will cheap APS-C only lenses handle 24mp resolution? Some people are asking if the fictitious A700 replacement camera, (announced well over a year ago, and now known as the A77) which uses a new 24mp APS-C sensor, will be too much for the older APS-C only lenses, which were designed for 6mp, 10mp, and 12mp sensors, depending on how far back you want to go. The answer, based on some simple tests with the 24mp Sony A900 is yes, most lenses should be able to show more resolution. Obviously, all the lens' optical faults will be more noticeable, but that's just the way it is. I find the newer APS-C lenses seem better than the rebadged Sony full frame lenses, and much cheaper. Look at the newest Sony "DT" lenses, like the excellent 35/1.8; its performance in some ways is superior to the (equivalent FF coverage) 50/1.4, which is better built, but a little outdated and more expensive. So what I'm trying to say here is; just because a lens was designed for a smaller sensor, doesn't mean it's inferior to a full frame compatible lens. Below are two crops from full size images, the top crop is from the Sony 16.2mp A580 and the bottom crop from the Sony 24mp A900. The lens used is the Tamron 60mm F/2 macro, which is for APS-C cameras only. Note; I also tested the Sigma 10-20mm F/4-5.6, which responded about the same way as the Tamron. I matched both APS-C and full frame capture areas by moving the camera and tripod, that's why the perspective is different, and done this way replicates a 24mp APS-C sensor. 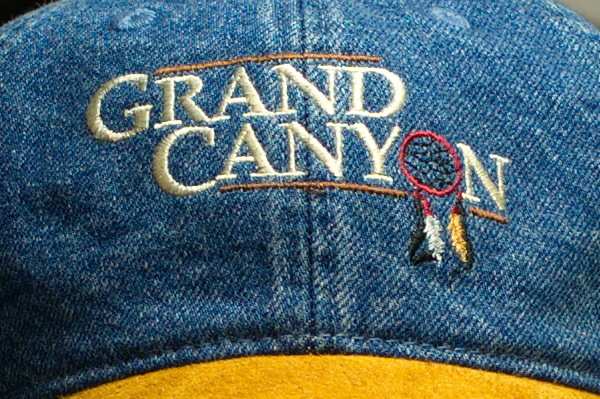 Bracket focusing (focus point is the "Grand Canyon" dream catcher on the cap) was used until the sharpest image was produced for each camera. The A900 APS-C size capture feature is turned off of course. Both images are from RAW. The A580 crop has been upsized to match the A900 size, which makes it easy to see the differences. The A900 has a slight disadvantage here, as the final capture area was a little smaller than the A580, but not really enough to be noticeable. It may look like there is a depth of field issue at the top of the cap, but that's not the case, it's the smaller detail in that areas that's more apparent with the 24mp sensor, that's why I used the cap with a fine weave. I used F/5.6, 1/4 sec, WB 3100k trimmed to M3, ISO 200. A580 with Tamron 60mm F/2 macro. Nothing much that's newsworthy, so another file photo from the A700. Here's another sample image using the old and crummy Sony A700, now with a broken mirror. 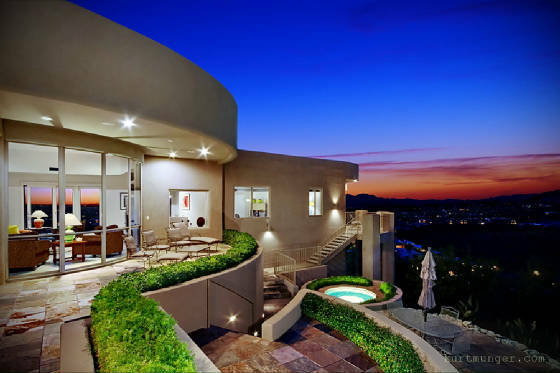 The lens used for this architectural shot was the (also old and crummy) Sigma 10-20mm lens, which I still use and love. This image was taken using five off-camera flashes, which wasn't really enough, but that's all I had at the time. I placed one flash overhead, close to the camera side, and aimed it over the foliage towards the curved soffit above. The next flash was placed on the lower patio area, fairly close to the ground by the wall, and pointed towards the foliage to bring out the tile texture and plants. Also in this same general spot, but farther back (still out of view by the wall) is another flash that's placed higher up, and pointed up to the curved soffit. On the next level down there's another flash close to the wall by the spa, and pointed at the house wall with the stairs, you can see the shadows created by this in the larger version, click the image to check it out. The final flash unit is to the right of the patio table on the lower level, out of view, and pointed at a tree and some foliage, but I ended up cropping this out as the wind was very strong causing too much blur, and I ended up not liking the composition, so that flash was wasted. I darkened the area from the flash to match the light value of the rest of the right side. I could've used a couple more flashes, or some powerful strobes. I almost missed this shot as I was running back and forth trying to adjust the lighting placement and intensity while the best light was quickly going away, that's the problem with doing a shoot without an assistant. For the interior, I re-shot the living room area, firing a flash though the windows to light the backs of the chairs etc, and using two more inside the house, you can see the shadows from this set-up. To finalize the image, I replaced the windows in the living room with the properly lit set and did the usual shadows, highlights, rotation and perspective (key-stoning) adjustments and some heavy noise reduction (the original image was a little underexposed, so raising the exposure in post processing increased the noise level). That issue isn't the fault of the camera because it doesn't have good high ISO ability, it's because the camera operator didn't do his job. The full image is a little soft, but shows well in my opinion. Specs for the shot are; F/7.1, ISO 200 1/1 sec, about 14mm (21mm equiv) focal length after crop, and I think all flashes were at half or full power. Don't wait for a phantom camera or lens. It should be clear by now that Japan's camera (and related accessories) manufacturing is going to be very slow to recover, but it will recover and be prosperous again, just not right away. This brings up a good question, and one that I've been asked many times recently; do you delay buying a camera or lens that's currently available, and simply try to wait it out, and hope that Sony comes out with the latest and greatest cameras and lenses this summer or fall, or do you just buy what's on the shelf now? For me, it's an easy answer; you buy what's available now! Who knows, due to the current demand, and the inability of retailers to restock items, there may be shortages coming up this summer, (not to mention later on this fall and holiday season), which could drive prices up and over the suggested retail prices, and on top of that, you worry about the pent-up demand for the new stuff that will eventually come out, and the shortages that will result from it, so no matter what, you're probably in for trouble in a few months if you wait. Again, my advise it to either keep what you have and enjoy it, or buy something now. I've been using the Sony A580 for a couple of months now, and find the image quality is very impressive, especially when recording in RAW. It has a great feature set, like HDR and panorama, both are very well implemented. High ISO noise reduction is very good, and easily beats the A700/A900 above ISO 1600. The A580 also uses the same battery as the A900/A700 and some other Sony DSLR cameras, so you don't need to buy a spare if you already have the NP-FM500H, that's why I bought it over the A55, which is basically the same but has no optical viewfinder, and uses a different battery. Of course, the A900/A850 are super good, even though they're two years old. If you're in to pixel peeping, and want the best image quality at the best price, get the A850. In my opinion, camera image quality hasn't improved much from the last few years, and probably won't in the near future. Yes, mirror-less NEX and translucent cameras are cool, because they're smaller and offer gimmicks. Good high ISO performance, HDR, Pan, and some trick modes are nice, but are not a necessity, and can still be done in advanced image editing software. Famous photo house flirts with disaster. Since I enjoy photographing homes and architecture in general, and reading about great photographers, I thought I'd put together a little background information on one of the most famous house photographs ever taken, the Case Study house #22, (Stahl house). What really made this house famous was Julius Shulman's 1960 photograph, shown in B&W, inset. Although the article is not yet finished, I thought I'd share this Google Earth image I came across while doing some research. 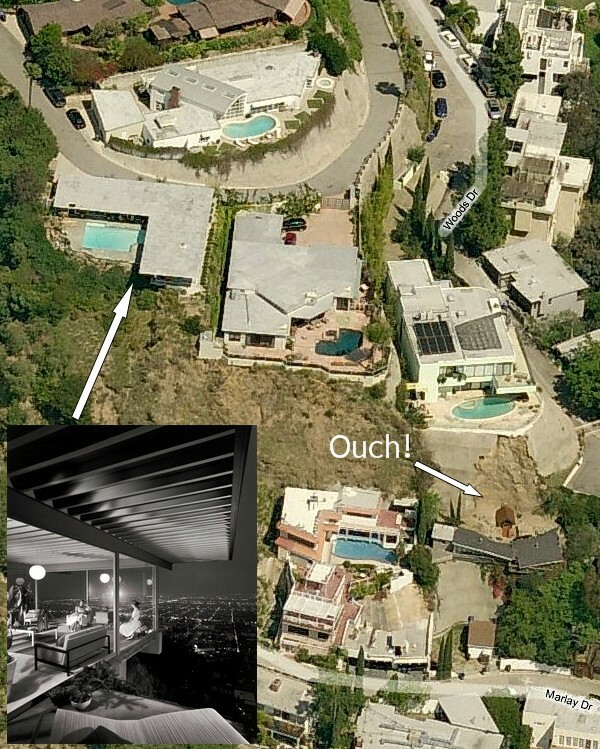 The larger image below shows the Hollywood hills Stahl house position in relation to the scary results of a typical California landslide, and how close they are; can you imagine if the ground under the Stahl house just gave way, and the whole thing tumbled down the steep hillside? What a loss that would be! Ironically, Julius Shulman's own Hollywood hills home suffered extensive damage from a landslide just a couple of miles from this location, before the Stahl house was built. I guess when you build on top of one another like they do in California, eventually you'll get wiped out, like the dude's house in this picture. 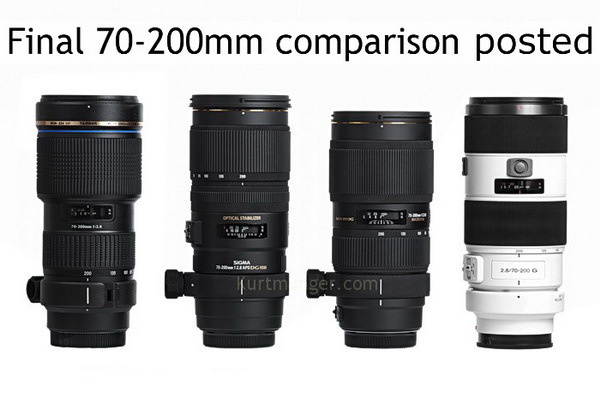 All four 70-200mm F/2.8 lenses compared, and Sony DSLR news. I posted the final version of the 70-200mm comp using the same crops as I have in each review, but now put side-by-side to see the differences between them. There are some random observations added at the top also. In a nut-shell, I'd say if you're looking for the best image quality at the best price, the Tamron would be your top pick. The Sigma HSM II is very good in both optical and build quality, but the dreaded Sigma quality control makes me not want to recommend it. If money is not a huge issue, the Sony easily wins, especially if you buy a good used copy. The Sigma OS isn't all that great, and is too much money in my opinion. Paul from Canada pointed out Sonystyle.ca has no APS-C DSLRs listed on the site, the only mirrored cameras are the full frame A900/A850. Aparently, the end has come for traditional APS-C cameras from Sony, at least in Canada! I'm guessing the tragedy in Japan and the continuing manufacturing problems has Sony reassessing product priorities, and only the newer stuff will be advanced. Sony A390 soon to be obsolete, and thoughts on other stuff. 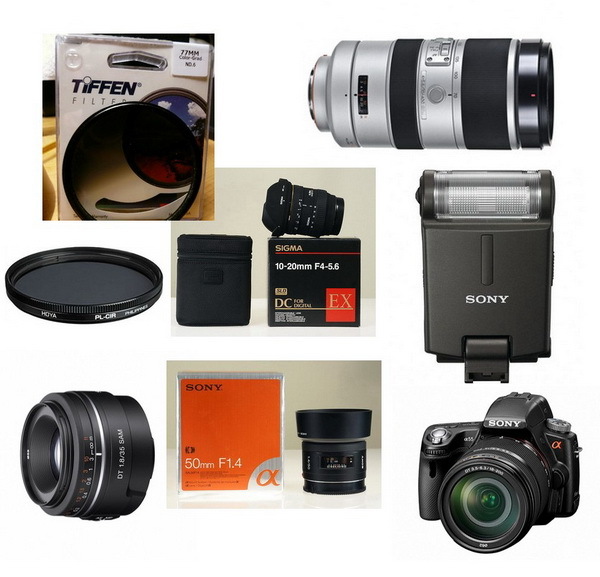 Sonyalpharumors is reporting the Sony A390 may soon be added to the list of Sony products that are no longer available. If true, the A560-A580 will be the only APS-C cameras with an optical viewfinder, and it wouldn't surprise me to see those phased out soon too. I liked the Vivitar 7mm fisheye I reviewed so much, I bought the loaner! It's wider than the Sony 16mm fisheye, but it's made for a smaller APS-C camera. Don't worry about manual focusing and aperture, most of your daylight shots will be in the range of F/8-11 at infinity focus, with some exposure compensation dialed in when needed. I'm starting to check out the Sigma 50mm F/1.4 HSM right now, let's hope this copy is good! I also have a Tamron 60mm F/2 macro lens. If everything goes well, I'll have those reviews posted by the end of the month or the first week of May. Look for a quick review of the CLM-V55 Sony monitor next month. I'm using it right now, and it's pretty cool! New ultra wide-angle lens from Sony coming soon? Sony re-introduces the HVL-F43AM ($350) flash from a couple of months ago, not sure why though as the press release says it won't be available until later this summer, at which time they'll re-re-introduce it I guess. What's notable is the flash power levels are switchable in 22 increments, from modeling flash, 1/1 through to 1/128 level in 1/3 steps, it's about time Sony!! The current low 1/32 level is too much sometimes. It also says it can detect white balance, and adjust, so can it detect when a gel is placed in front of the strobe? Really interesting is the spec sheet for the new flash. If you look carefully, (which apparently most people don't) you'll find the built-in diffuser will cover 15mm! The last time Sony came out with a new full size flash it covered 16mm with the diffuser, and Sony didn't have a 16mm lens at the time, but a couple months later the CZ 16-35mm appeared. So what do you think, a 15mm full frame prime, or maybe a 10-20mm APS-C lens like Sigma's, which covers the equivalent of 15-30mm. Anyhow, I just thought it was something to point out. I see Sony has the hoods coming for the Sony 35/1.8 and 85/2.8, although they are both the same, and come with the lenses, so unless you lost your hood, this isn't useful news. The last item, and the only one that's really new is the VCT-55LH bracket for mounting a light, or the new CLM-V55" LCD, it's a cold shoe mount, so it won't carry any power, it just provides an additional place to stick something if your hotshoe is in use. One last item; if you are looking to buy some camera stuff from B&H Photo very soon, make sure you order by 12pm this Sunday, otherwise you'll be waiting for April 28th as a ship date. There are still hot deals on the NEX system. Buying your goodies at B&H Photo allows me to review the latest camera gear. Without your support, there won't be any new reviews!! Check out the review of the Sigma 70-200mm F/2.8 OS HSM lens. The Sigma 70-200mm F/2.8 APO EX DG OS HSM (optically stabilized) is the final lens (thankfully) to be reviewed in the 70-200mm F/2.8 group of four, and also the most expensive after-market model. Just like the last Sigma (see 4/6/11 post) lens reviewed, I used three lenses for this review, and all three seemed about the same in image quality, so I'm thinking the quality control for this lens is ok. The Sigma 70-200mm OS build quality is good, (but not as good as the Sony), and it offers the same type of fast, almost silent focusing system that Sony uses (SSM). Unfortunately, there are a couple of things missing on the lens that should be included in this price range; like some focus hold buttons and a focus limiter option to speed up focusing in certain situations. The Sigma 70-200mm F/2.8 OS is pretty sharp from F/4 and up near the short end, however, as you zoom out near 200mm, the image sides are not as sharp as the Sony or Tamron equivalents. There are a few impressive qualities to this lens, like the stunningly sharp centers at F/2.8, 200mm, and the very smooth out of focus highlight blur (bokeh). The lens based optical stabilization works well, and offers a little more practical advantage than Sony's Steadyshot, see that comparison here. Overall, I think the Sigma 70-200mm F/2.8 HSM telephoto zoom lens with optical stabilization is not all that impressive considering the price tag is in the neighborhood of the excellent Sony 70-200mm F/2.8 G.
Just a few updates on what's going on this week; the Sigma 70-200mm F/2.8 OS lens review should be ready in a day or two, no QC problems with this one, but there's always something with Sigma right! I'm nearly done with the comp of all the 70-200mm lenses, so I'll post it this week too, it'll be quite interesting. I have a Hoya IR filter that I've been checking out, so look for a short review soon. 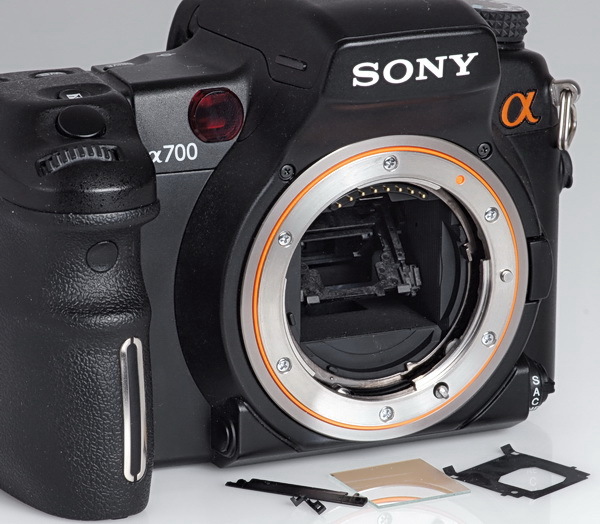 Also, thanks to all the people that wrote me about the A700 mirror retainer. I checked with Sony, and they're out of stock, and it seems it may be a long time before they become available again, if ever. There's always scotch tape, (and btw, it works)! Ever wonder what the real-use difference is between RAW and jpeg on the Sony A580? Check out the crops below. 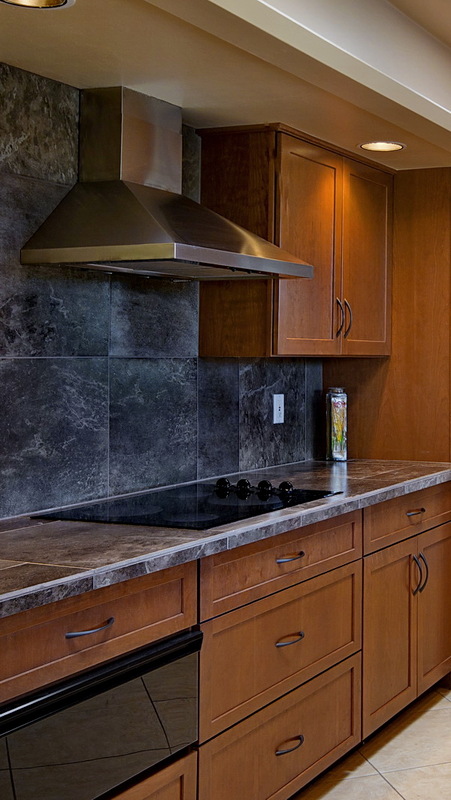 The large image below is a crop from a set-up shot of a newly remodeled kitchen. Although I didn't use this particular image, I did notice the differences in files when doing some PP. I normally shoot cRAW for everyday jobs, and full RAW for more important stuff. The A580 has no cRAW like the A700 and A900, so I decided to shoot RAW+jpeg because I haven't messed much with the A580 RAW conversions, and didn't want to have any surprises in post processing etc. The A580 creates a fine jpeg along with a RAW image, and I was surprised at the smearing in the fine image. The Sony A580 is very capable for interior photography, (and all photography for that matter), but I wouldn't advise using jpeg, there's too much luminance smearing, Sony should allow this to be adjusted, hopefully in a firmware update. You can clearly see the jpeg is wiping out the cabinet wood grain completely, and the back splash tile has no detail either. Specs for the shot; F/7.1, ISO 200, 1/5sec, 20mm (30mm equiv). No sharpening has been applied. 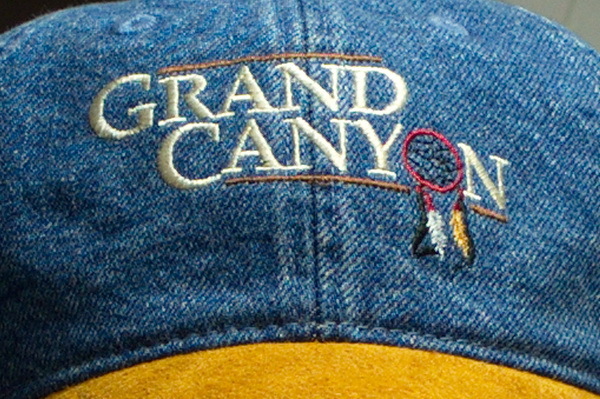 Crop from center right, A580 RAW, then converted to jpeg. 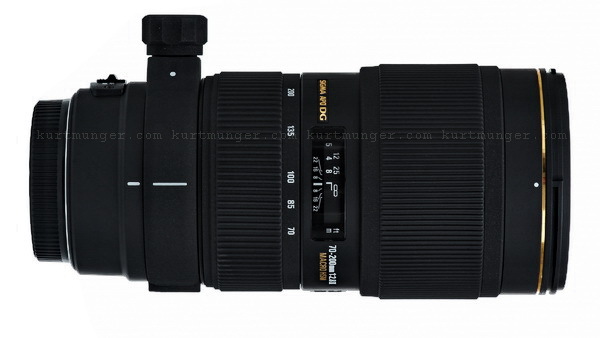 Check out the review of the Sigma 70-200mm F/2.8 HSM II macro lens. The Sigma 70-200mm F/2.8 HSM II is a lower-cost alternative to the more expensive Sony 70-200mm model, also tested here. How does it stand up to the Tamron and Sony equivalents? Has Sigma's quality control improved? read on. 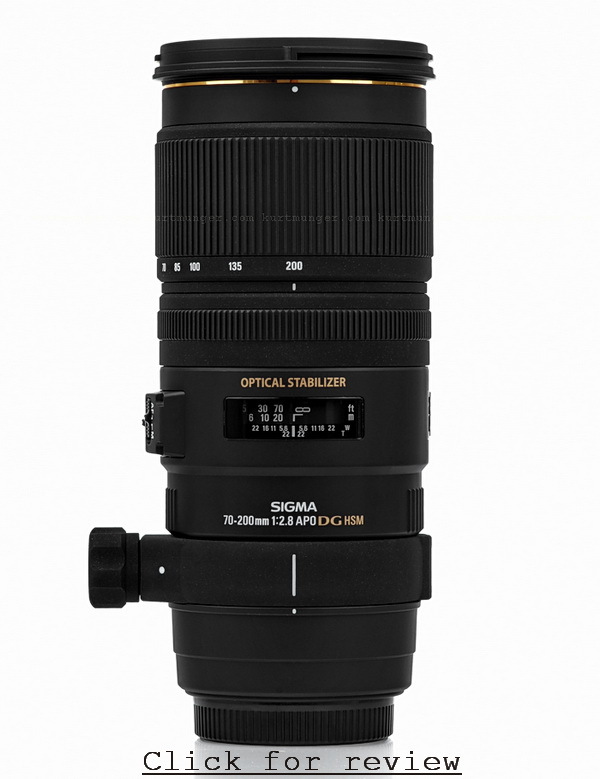 This Sigma fast telephoto zoom lens is quite impressive for the price. Build quality is very similar to the Sony, and it offers the same type of fast, almost silent focusing system, which uses a motor inside the lens, and works just as good as Sony's SSM in my opinion. There are a couple of things missing though, there are no focus hold or focus limiter buttons to speed up focusing in certain situations, but not everyone will miss those items. On the upside, the lens performs very well optically, with good contrast across the frame, especially at the short end, along with relatively low distortion and light fall-off, although color fringing at the long end is quite noticeable in some images. The Sigma 70-200mm HSM II is very sharp at almost all apertures near the short end, however, as you zoom out near 200mm, the image sides are not quite as sharp as the Sony or Tamron equivalents, but that's only visible when you display the crops side-by-side as I normally do. The Tamron 70-200mm F/2.8 also tested here performs about the same as the Sigma HSM optically, but doesn't come close in focusing speed or build quality. Final thoughts; Sigma's quality control is awful, I used three lenses for this review, the third lens they sent me was a winner. If you want to try your luck, and are patient, you might wind up getting a good one, at which point you'll be hard pressed to tell the differences between the Sigma 70-200mm F/2.8 HSM II and the Sony 70-200mm F/2.8 G, in both sharpness, focusing accuracy and speed. At the time of this review the Sigma is about half the price of the Sony, which makes it a great bargain....but only if you get a good copy! I'm still using the boring stamp shots for the test samples, because of time constraints, as I'm simultaneously doing the comparisons with the other equivalent telephoto zooms, all using the full frame A900. If you want to know how the APS-C cameras perform, just look at the full frame mid-section crops, that's the same general location of the APS-C corners, of course the centers are the same. 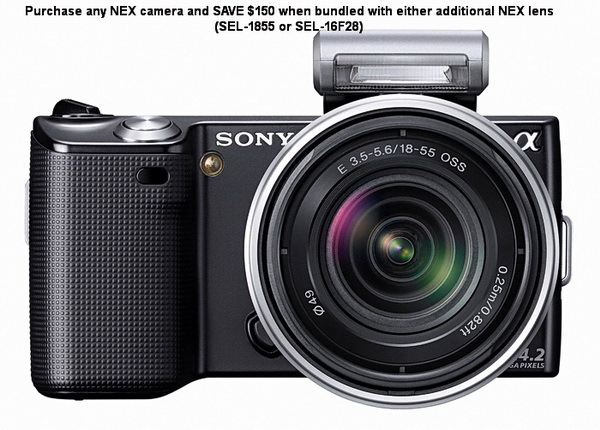 Check out the deals for the NEX 3-5. These little cameras have DSLR image quality, but will fit in a jacket pocket or jeans pocket with the 16mm pancake lens. If you're thinking about waiting for an updated version to come out, you may be in for a long wait. Apparently Sony has suffered some serious facility/production losses due to the recent disaster, and in doesn't look like any new products will be issues soon. If you want a nice camera to carry around on vacation, don't take your A900/850, they're too big and heavy, take it from someone who's made that mistake too many times, me!! Look carefully at the NEX-3 with both 18-55mm and 16mm for about $699, or the NEX-5 for a little more money. Basically, If you buy either additional lens you get $150 off the total purchase price. The deal doesn't include the NEX 18-200mm lens, although for me, that lens is too darn big for the NEX system. All purchases come with a free Lowepro case and 4gb card. I'd go for the NEX-5 if you can swing it because it's a little smaller and slips into a very small space. I've put the February homepage stuff in the archives, including the Sony camera ISO comps which is also located in the "recent articles and reviews" column on the right. Nearing the end of the road for the A700! I got a black screen and error message while taking pictures last week, so I turned the camera off for a few seconds, then turned it back on and tried to take a picture, but the same problem occurred. I then decided to take off the lens, and as I did that four pieces from the mirror system fell out! I'm estimating this camera has approximately 90k shots so far, but it should have lasted longer than that, oh well. Believe it or not, the camera still takes great pictures! AF seems to work ok. Unfortunately, it requires full manual exposure as it over-exposes by about five stops. You also don't get anything through the viewfinder, so you have to guess, compose, take the picture and adjust as necessary. I think I'll try to glue the mirror back in and see what happens, there's nothing to lose in that procedure right! Below in front of the camera from left to right; two mirror retainer pieces, main mirror, thin black plastic piece which is used as a baffle for the secondary mirror below the main mirror, it goes between the main mirror and the mirror platform in the camera. Something I didn't know; the mirror is transparent! It only reflects at a certain angle. It looks almost identical to the SLT mirrors unless you turn it just right. Also, as mentioned above, there is a smaller, secondary mirror below and inside the main mirror which follows the main mirror in travel, I guess this is to keep light in to the system while the main mirror is up towards the top of its travel and not reflecting much light. When the main mirror is up fully, so is the secondary, otherwise the shutter would be blocked.